Mr. Thomas Plummer Clarke, Engineer and Battery Manager at the Waihi Gold Mining Company's works, Waihi, was born at Northwich, Cheshire, England. After completing his education he was apprenticed at the extensive works of the Union Foundry, Bolton, Lancashire. He passed through the drawing offices, pattern-making, and fitting rooms—in fact, every department, and gained a general knowledge that has been extremely useful to him in his colonial life, as it has enabled him to take control of the complicated machinery now used in gold saving. After finishing his apprenticeship, he was sent by the firm to Russia, to superintend the erection of an engine and gearing for working a large mill; and during a three years' residence in that country he erected, on behalf of the Union Foundry Company, three other mills for various manufacturers. After his return to England Mr. Clarke visited Canada, and spent twelve months in erecting machinery in the Dominion. On going back to England, he joined successively Messrs John Penn and Co., of London, and the Northern Iron Works and Shipbuilding Company, of Southampton, where he assisted to put in the engines of the “Minotaur,” up to that date the largest man-of-war in the navy, and afterwards the flagship in the Mediterranean at the bombardment of Alexandria. Subsequently Mr. Clarke revisited Russia as representative of Messrs John Musgrave and Sons, of the Globe Iron Works, Bolton, and erected and afterwards took charge of the large flax spinning mills of Messrs Cludoff and Sons, on the Volga. Later he was for two years and a half in charge of Messrs Karetnikoff and Sons' cotton spinning mills, at Teakora. Mr. Clarke then settled down, and for twelve years had the management of the flax spinning mills of Mr. Joseph Sinkoff, who, when Mr. Clarke left his employment, presented him with many valuable mementos of the estimation in which he held Mr. Clarke's services. Mr. Clarke's last occupation before he left for New Zealand, was the drawing of specifications, etc., for the completion of a coal-cutting machine. He arrived in Auckland in 1885, and for twelve months he locally represented several machinery makers in the Old Country. The Onehunga sawmills then fell into his hands, and after working the business for some time he floated it in England into a Limited Liability Company, of which he retained the management. This company was eventually absorbed by the Kauri Timber Company. In 1896, Mr. Clarke was temporarily employed in erecting the large pumping and winding plant at No. 2 shaft on the company's ground, and on the completion of that work he received his present appointment as mechanical engineer and battery manager of the great Waihi Gold Mining Company. Mr. William M. Russell, Battery Manager for the Union Waihi Gold Mining Company, was born in Invercargill in 1870. For four years prior to 1889, he was engaged with Walter Guthrie and Co., Ltd., in his native place. He afterwards went to London, where he studied mechanical engineering and electrical engineering for eighteen months at the London University College. After returning to New Zealand in 1898, he was for two years at the Victoria Battery, Waikino, and was appointed to his present position in January, 1900. 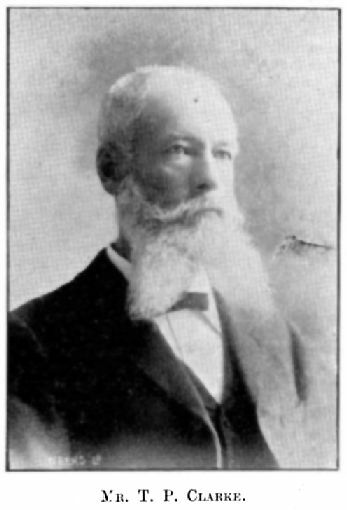 Mr. Hubert Barey, J.P., General Superintendent of the Waihi Gold Mining Company, Limited, has been in charge of the mines and batteries since 1891. He is elsewhere referred to as chairman of the Ohinemuri County Council. Councillor Hubert Percy Barry, J.P., who (1900) has been for upwards of five years Chairman of the Ohinemuri County Council, had a good many years' experience in engineering works in the Old Country, before leaving for South Africa. He was for a few years in Swaziland, South Africa, where he was employed in connection with mining concessions, and was appointed to the general superintendency of the Waihi Company's mine in 1891. Soon after his arrival Mr. Barry became chairman of the Ohinemuri County Council, and with the exception of the period during which he was away on a visit to England, he has since held that important position.